Contents: Onilne Texts and multiple-choice tests. Already own the text Therapeutic Chair Massage? Call us at 1-800-364-5722, 9am to 5pm, to discuss your enrollment options. Description: Based on a textbook by Ralph R. Stephens, this course includes 2 parts. Part 1 teaches key concepts of seated massage and provides encouragement to seek additional hands-on training. 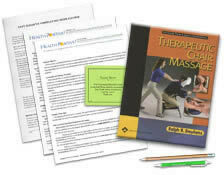 The text, photos, case studies and sample forms will benefit both new and experienced seated massage practitioners. Discover this expert’s recommendations for equipment, communication, documentation and body mechanics. The ethics part presents key ethics concepts related to seated massage including safety considerations; recommended products for sanitation; contraindications, setting your fees; establishing contracts; identifying target markets and choosing effective promotional strategies. As a FREE bonus, the textbook also provides detailed instructions and photos for numerous seated massage routines. Describe at least 4 ways to use posture, movement and breathing to prevent therapist injury. Identify the recommended safety considerations for seated massage, including recommended products for sanitizing the therapist’s hands and massage chair in normal and rushed situations. Describe the key elements in the determining if massage is appropriate, partially contraindicated or totally contraindicated. Identify the key ethical considerations when setting rates and establishing contracts with individual and group clients. Describe the key elements in identifying target markets and choosing effective promotional strategies for seated massage.